Staunton Meend is an area of heathland where the bracken and birch are regularly controlled to provide an open aspect. We spent the day in the glorious sunshine removing the birch from further down the heath. There were signs that the heathland had been treated by a bracken bashing machine which is a yearly maintenance task. In the bright sunlight, the team commence with the removal of the birch which still has bright yellow leaves. This is interesting for those of you who like statistics! The image on the left was taken on a GPS watch at Staunton Meend and shows the traipsing around which we do on a normal Dean Green Team day. We average about 1 mph during the day but included in that is all the lopping, sawing and piling up of the brush and logs. At the bottom of the heathland this boggy area was fun. It is on a layer of peat and, as we squished our boots in it, little spirals of bubbles and water spurted up just like mini geysers! 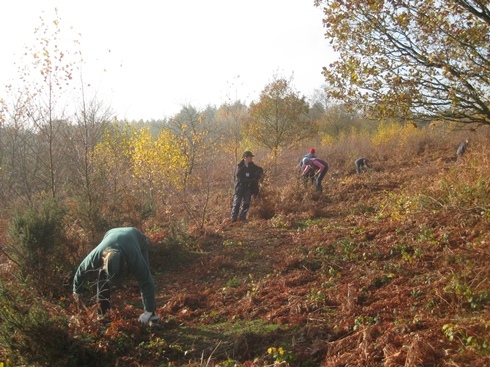 The project aims to restore the Meend to an acid grass/heathland by the control of invasive bracken, bramble and birch. Work has been undertaken to allow grazing to recommence as the primary management tool. 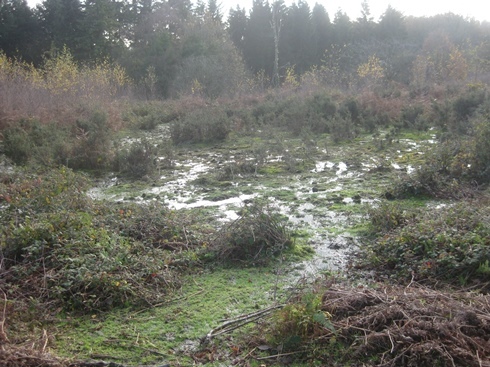 •	Initially approximately 13 hectares of the Meend was excavated by a digger to remove 4-6 inches of bracken brash which had built up after grazing ceased. •	The aim was to uncover the mineral bed to allow germination of dormant heather seed. •	Over four successive years the bracken was rolled with a bracken basher to weaken its growth. •	The perimeter was made secure by the restoration of drystone walls, replacement of fencing and gates and the installation of cattle grids. •	Each autumn heather seed has been distributed across the Meend by either planting or broadcasting sprigs. The heather is regenerating both naturally and as a result of seeding. •	One new pond has been excavated, others cleared of unwanted plants and one has been extended. Interestingly the clearance task is now managed through ponies browsing. •	Exmoor ponies were introduced in April 2012 and have been eating their way across the common removing bramble, creating clearings and damaging the bracken rhizomes. •	This year surveys will be undertaken on grass species, invertebrates, birds and flowers. 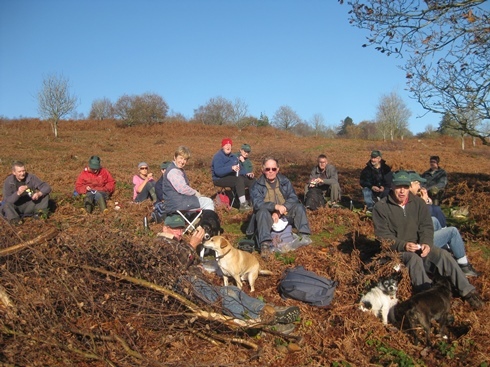 •	The project has been supported by volunteers from Staunton village, the Wye Valley AONB, the local Mormon church, Parkend Scouts, The Heart of the Forest School, Lakers School, The Wye Valley Youth Rangers and The Dean Green Team.